Material Content: 3 layers - trioxon lining, rubberized material in centre and nylon outer. "I have had plantar fasciitis for almost two years and had to give up the running programme. Three weeks ago I purchased the Plantar Fasciitis FXT Night Splint and have been using it nightly. I have made some progress for the first time in over a year." "I received the Plantar Fasciitis FXT Night Splint a month ago and now I am pain free. What a great concept. So much better than taking medication this masks the pain temporarily. After two weeks of using the Plantar Fasciitis FXT Night Splint I am able to walk and play football again. Thanks so much for the great invention." 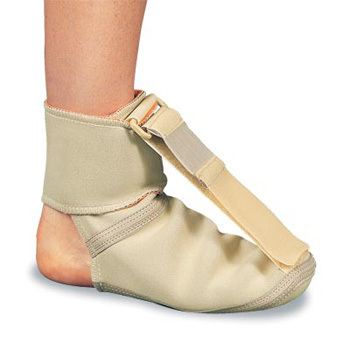 "The FXT Night Splint has definitely helped my plantar fasciitis. Before I started wearing the splint, I could barely walk on my foot each morning. The doctor said I was basically re-injuring it every morning when I stood up, so it wasn't healing. When I wear the night splint, though, my foot feels much better in the morning and throughout the day. I can tell the difference if I miss a couple of nights! I definitely would recommend it." I'm just writing to say that the Night Splint you sent me is brilliant. My heel spur is so much better than it was - (5 weeks on). Also the Dr Foot Pro Insoles help tremendously during the daytime. My life is back to normal again!